My brief for this piece was to unpick the meanings of the terms: Skills, Competencies, Capacities and Literacies. Although supporting the One by One enquiry into digital literacies in museums I was given freedom to reflect generically beyond it. My reflections arise from an interest in how digital has transformed the possibilities of cultural learning, for example, what it offers for social or paragogic learning, or for an ecological interpretation of culture. If I was to write a treatise for the abilities needed by museums, it would include systems thinking, anticipatory planning, imagination, and a raft of social and emotional abilities, before any technical skills. I see relational situations as the key to understanding how meaning is made, how abilities are acquired and how authority to teach is conferred. Building on this, I’d suggest that the more complex the situation, the more that mastery of abilities requires enhanced consciousness of the relational situation of one’s work. Public discourses about how we educate for future needs are too simplistic for this emerging complexity and uncertainty. So, to the question, what do these terms mean? And, how are each of them important in our current context? First, how do we agree what terms mean? The four terms in question are employed not so much as accurate labels but as power tools in contests about the development of people. The metaphor of ‘power tools’ came to my mind because I’m writing this against an aural backdrop of neighbours’ building work: Our situation governs our choice of words, and also their reception. The meanings of all terms are provisional, but some can be more multi-purpose, or bluntly heavy-duty, than others. The more contested the situation in which terms are employed, the more they are liable to be used as tools either for construction or for conflict. More often the latter. I intend this piece to contribute to a hermeneutic approach, whereby my take on the four terms is not laid down as the authority, but is offered as a blueprint for further shared interpretation. A hermeneutic mode fits with the idea that meanings are made, and abilities acquired, through relational situations. Meanings or processes are tried out and those that work best for the situation or the group might stick, and are reinforced and adapted with use. There may be friction around this but there is also flow, and good leadership of groups can enable that flow. Museums can be the most complex (and fascinating) types of organisation because they work across all five modes of agreement listed above. They produce creative work, manage business operations, conduct research, market to audiences and host intercultural dialogues, and so on. The meanings of terms such as ‘learning’, ‘curating’, ‘outreach’ or ‘sustainability’ can be hotly debated between these different functions. Where a museum’s leadership supports hermeneutic processes, where common ground and learning flows between teams, these debates don’t fester but instead can fuel collaboration. In addition, arguments about future abilities can get stuck in opposing camps because the paradigm frames are too fixed. Particularly when presented in mainstream media, the debates are too simplistic. People are brought together from situations with different modes of agreement, but the facilitation of debate does not support them to learn from each other. For example, in the ‘Knowledge versus Skills’ debate, both sides are correct in some way, but one side might emphasise the process of learning and the other its outcomes, so they will always misinterpret each other’s position. Those against a Knowledge-based curriculum are accused of wanting to deprive learners of knowledge. With their Skills-based framing, they mean that knowledge is best reinforced through practice in real settings, that abilities held in muscle memory and in social behaviours are more permanent than those transmitted through abstract instruction. Those against a Skills-based curriculum believe that know-how is best contained and transferred in linguistic or cognitive formats. This Knowledge-based framing corresponds with a belief in social mobility, that one succeeds mainly by affinity with networks and comfort with protocols, aided by linguistic Cultural Capital. Capability, noun, the ability or power to do something. Skills is shown as an origin term, more common in use than the others, and therefore a capacious or baggy concept. Unlike the other Latinate terms, it’s from an old Norse word (that is, ‘skil’, meaning discernment or knowledge; and it’s interesting that this old meaning doesn’t refer to the physical or manual abilities which characterise its interpretation now). Possibly, the Latinate terms have come to supplement or replace Skills, which has been associated too much with training for manual labour, when any curriculum body or institution worth its salt would want to be associated with intellectual and professional aspiration. Competencies is shown coming directly out of Skills because it is often used in tandem. 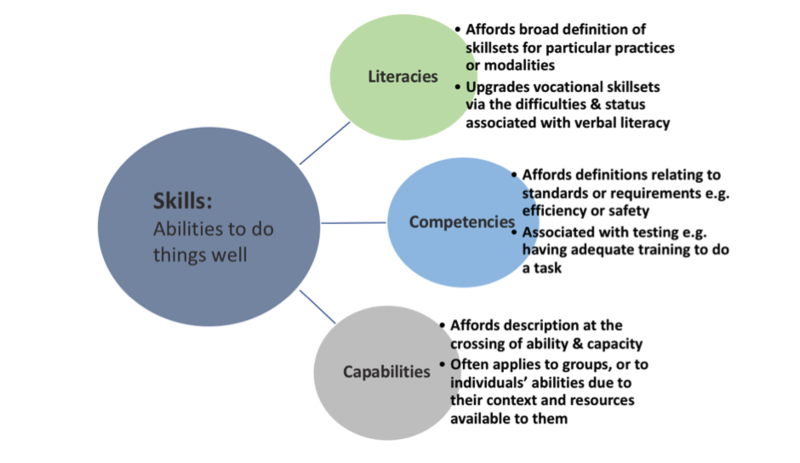 In Skills-based frameworks, competencies are often applied to the assessment of abilities, with precise descriptions of standards to evidence them. So, if you are skilled at boiling an egg, the Competencies might include placing an egg in the water pan without breaking it, timing the boiling for different preferences of hardness, and removing it without burning yourself. However, Competencies is almost as much of a baggy concept as Skills, and has come to be used to mean a range of things. Competencies are often used outside Skills-based frameworks to encompass not just Skills, but the knowledge and personal attributes that are needed in order to demonstrate full ability to perform a role. Beyond even this, Competencies can be used to try to define the motivations and values that might optimise someone in a role. Despite this bagginess, it can be distinguished from Literacies and Capabilities in that it is most often used in a business setting, used for training and recruitment of individuals. Literacies is the term most often used by industry bodies or campaigners to advocate a set of abilities needed for future work and society. Literacy is essentially the twinned ability to transfer speech or thought into graphic letters and to decode those letters into meaning. Around this have been discussed or codified many other abilities to enhance the effectiveness and expressiveness of meaning-making and communication, so that Literacy, a well-resourced area of education, has grown into a broad array of abilities. Since the 1990s, when in the UK at least, Literacy (and Numeracy) expanded to fill space in the National Curriculum, we’ve seen waves of campaigns for alternative Literacies: Visual Literacy, Multimodal Literacy, Information Literacy, Emotional Literacy, Wellbeing Literacy, Financial Literacy, Ecological Literacy, Science Literacy and Digital Literacy. Some of these campaigns acknowledge that Literacy per se is core to their alternative skillset (e.g. Information Literacy relies on reading) or that Literacy can be taught through creative activities such as Music. Others emphasise that decoding information goes way beyond letters, to include sounds, body language, images and natural phenomena. Some campaigns use Literacies more as a metaphor or starting point, with other social, emotional and practical abilities incorporated into their manifestos for Literacies. For example, Science Literacy was about broad knowledge of the application of science and its discussion in society. The JISC definition of Digital Literacies is ‘those capabilities which fit an individual for living, learning and working in a digital society’. Doug Belshaw, in his PhD thesis and 2014 book, ‘The Essential Elements of Digital Literacies’ identifies these as Cultural, Cognitive, Constructive, Communicative, Confident, Creative, Critical, and Civic. Because none of these are overtly technical, it suggests that character attributes are more important than mastery of digital tools. It comes across as a provocation that for people to thrive in a digital world, these character attributes are the foundation of permanent abilities upon which any temporary technical abilities can be easily acquired as needed. It could be argued that all abilities are essentially about accessing, decoding and communicating information, particularly in the 21st Century, so Literacies are a suitable generic term for abilities. However, I think Literacies are only a part of what makes somebody able to achieve something. There are also elements such as mastery of materials and equipment, manual and other physical abilities, and personal motivation. These can’t be reduced to the processing of information. Capabilities are often used in social and health care, for example in assessing what support is needed for a person with disabilities or multiple disadvantages. They are also used to describe the abilities of whole teams or organisations, for example, of a business being capable of innovation or collaboration. Capability combines ‘capacity’ with ‘ability’. Capacity comes from the Latin root ‘capere’, to take or take up (e.g. as in a cup). The addition of -ability makes it more active than ‘capacity’, affording description of what can be achieved, not simply what can be coped with. So, a person with disabilities might have capacity to stand up unaided, but have capability of various other movements with the right care, equipment, removed barriers and supported practice. Capabilities are seen as highly contextual: they might empower individuals but are not their sole responsibility. Essentially, the four terms are synonyms, but with differences in origin and use. I tend to favour Capabilities of the four because people’s abilities to achieve their goals are highly dependent on so many factors. Competencies: Concrete descriptions of optimum performance by individuals, regarding specific areas of activity such as service design, project management, or social media hosting. These need to be refreshed constantly to adapt to new technologies and methodologies. Literacies: A core element of Capabilities. Access to, and familiarity with, relevant and diverse vocabulary, methodologies, practitioners, best practice, ethics and professional enquiries. Mastery comes about through practice in situations where Capabilities are maximised, where descriptions of Competencies are continually refined and refreshed, and development of Literacies provides an enhanced consciousness of the relational situations of one’s domain. I’m using ‘abilities’ as the umbrella for all four terms. I might otherwise use ‘skills’ as the generic term, but this would be too confusing here. An alternative spelling is ‘peeragogic’. Paragogy is learning through interaction between peers. Mastery could be defined as comprehensive competency, affirmed by others with equivalent competence. This is better defined now as part of a framework called Science Capital, developed by KCL with UCL.